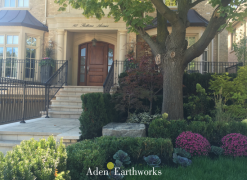 Welcome to Aden Earthworks, we specialize in creating beautiful outdoor spaces for residential, commercial and industrial properties. We have been servicing the Toronto and GTA area since 2003, working closely with our clients to create the outdoor space of their dreams. 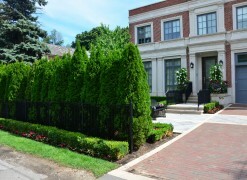 We work closely with our clients to meeting their landscaping design needs. Our team of experts in landscape architecture, horticultural sciences, civil engineering, and urban planning will create the outdoor space of your dreams. We take care of all sizes and types of properties, including maintenances of commercial, industrial, condominiums and residential properties. Our team of professionals will provide lawn and garden care services at weekly intervals. 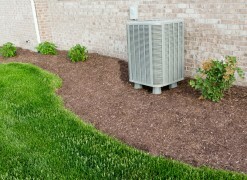 We specialize in grass cutting, seasonal clean-ups, debris removal, and more. Our team of construction experts will bring the project of your dreams to life. We use the highest quality materials in our construction and masonry projects, ensuring longevity and quality you can enjoy for years to come. Our team provides snow plowing, shovelling, salting, and snow haulage services to areas across the GTA. Take a break this winter and let us take care of your residential (limited geographical area), commercial, industrial, or condominium property, no matter the weather conditions. Our large selection of designs and materials allows us to build custom decks and fences that compliment your property. We can add raised decks, construct privacy fences, protective gates, gazebos and arbours. Add a botanical flare to your outdoor space all season long with gorgeous urns and seasonal planters. Our team will work closely with you to choose the perfect plants and flowers to compliment your outdoor and indoor displays. Available for both commercial and residential properties. At each step of the way Aden exceeded expectations and left a wonderful product that we hope to enjoy for years. The crew was very friendly and nice to deal with. The guys were patient, i gave them specific request and they did everything perfectly. I was very pleased with the finish product. My neighbour liked it so much, she copied it. I would recommend Aden for floral arrangement with a different twist. I just leave it to Ben and his crew and my lawn is the envy of my block. His crews just show up on a regular basis and make my lawn look like paradise. Aden Earthworks really did a fantastic job. They put in all new grass in my backyard and my kids couldnt be happier. AE’s employees were all pleasant people to have around my home, and were fast workers and knowledgeable about plants and gardens. The job was done on budget and on time and we love the finished result. Thanks to their creativity my background went from ordinary to a work of art. Service was exceptional. The crew that worked on my yard was professional, knowledgable, courteous and they created the perfect garden retreat. I would highly recommend them to anyone wanting to upgrade or redesign their garden. The project was completed in a timely and careful manner and came in UNDER budget! We have no hesitation in recommending this company to anyone.